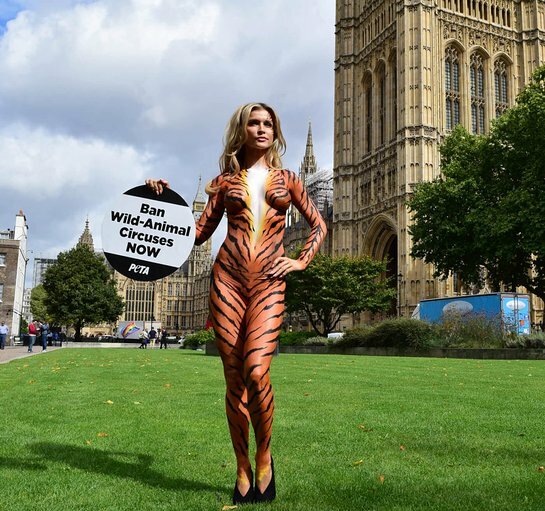 With the UK Parliament back in session, Polish-American model Joanna Krupa took time out of her flying London visit this week to pose bodypainted as a tiger outside Westminster in order to put pressure on the government to introduce a long-overdue bill banning the use of wild animals in travelling circuses. Former Prime Minister David Cameron promised to put a stop to these archaic animal acts by January 2015 but failed to do so, even though 94 per cent of respondents to a government consultation – including the British Veterinary Association – demanded a complete and permanent ban. Wild animals in circuses spend their lives confined to cages or trailers when they’re not being bullied into performing tricks. They commonly endure abuse and are denied the opportunity to engage in natural behaviour. 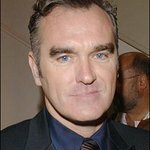 They also frequently display abnormal behaviour and suffer from chronic health problems and psychological disorders – and many die prematurely. PETA – whose motto reads, in part, that “animals are not ours to use for entertainment” – notes that by implementing the legislation, England and Wales would catch up with Austria, Belgium, Finland, Mexico, the Netherlands, and the many other countries that already protect wild animals from exploitation in a wholly inappropriate circus environment. Krupa joins Michael Sheen, Martin Freeman, and Pamela Anderson in teaming up with PETA to raise awareness of the plight of animals in circuses.